On Wednesday 18th April, Ski Independence and Osprey Holidays had the pleasure of welcoming many of our Travel Agency partners to Edinburgh Castle for an evening of education, wine and nibbles, hosted by Switzerland Tourism. 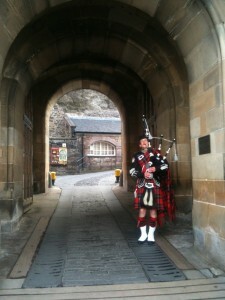 The evening began with a traditional Scottish welcome as guests walked over the drawbridge and up the steps to the castle, accompanied by the skirl of pipes, with the Edinburgh skyline shimmering in the rare evening sunshine – stunning! Our Swiss friends, old and new, came to Edinburgh to promote their regions and transportation, and the theme for the evening was water – something Switzerland has in abundance with its lakes, waterfalls, fountains and glaciers. It was fantastic to see so many travel agents – we talk on the phone so often, but rarely meet face to face, so it’s great to put a few faces to names. Every stand was buzzing with conversation as the agents sought to solve the puzzle and find ‘Bella the Cow’ to be in with a chance of winning a Fam trip to Switzerland. Bella travels all over Switzerland, and has been seen in many resorts including Villars, Saas Fee and Zermatt.